Tammeamea King of Hawaii, the Sandwich Islands. Naba Leba king of Solor. The Solor Archipelago is an Indonesian archipelago and part of the Lesser Sunda Islands to the east of the Malay Archipelago. Death of Tammeamea king of the Sandwich Islands. Accounts from Petropawlowsk in Kamtschatka of the 10th Nov 1819, received by way of Saint Petersburg, give the following particulars of the death of Tammeamea, king of the Sandwich Islands, which event took place in the month of March of the same year. The statement is derived from the reports of American vessels. “Before the death of the King, an extraordinary phenomenon took place: within the space of three hours, the water of the ocean rose and fell on the coasts of the Sandwich islands for a space of six feet, with such a regularity and calmness that the ships in the harbor, and the villages situated near the coast, suffered not the least injury. The inhabitants of Owaihi looked upon this as an omen of their Sovereign’s approaching death. 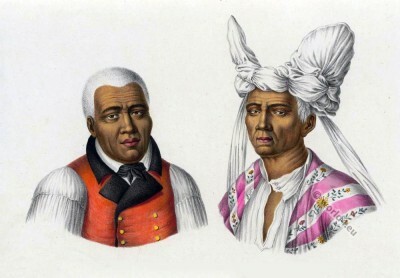 In the mean time his Majesty had collected round his death bed all the chiefs of the islands submitted to his power; and he made them promise religiously to maintain all the useful establishments founded by him, “which we,” he said “owe to the white people that have come to live among us.” These he requested to be respected before all others; that their property should be held sacred, and those rights and privileges be preserved to the white visitors, which they had enjoyed during his reign. Hereupon he appointed one of his sons, named Rio Rio, to be his successor. This youth, of about twenty years old, has been brought up in the European manner, and is said to speak English tolerably well. According to the custom of the country, Tammeamea made all the present chiefs take the oath of allegiance to this newly appointed sovereign, and recommended him, on account of his youth, to the care of his consort, by which act he made her the temporary and virtual regent of all his possessions. A few hours after, this remarkable prince expired. By the law of these islanders, the acknowledged successor is obliged to leave the spot, and even the island, where the sovereign died. But the bold and ambitious young Rio Kio said to his friends on his departure from Owaihi, “Since my father has thought me worthy to reign in preference to my brothers I shall suffer no other power over me: and after the expiration of the time, I declare to you, I shall either return as actual king or never return alive.” The chiefs, who had remained at Owaihi, were engaged in military exercise, and the whole island was filled with warriors, mostly armed in the European style. Even foreign ships in the harbour were obliged to arm themselves. This entry was posted in 18th Century, Nobility, Oceania, Sandwich Islands and tagged Traditional Oceania costumes on 5/8/15 by world4.